Negora fans be prepared! 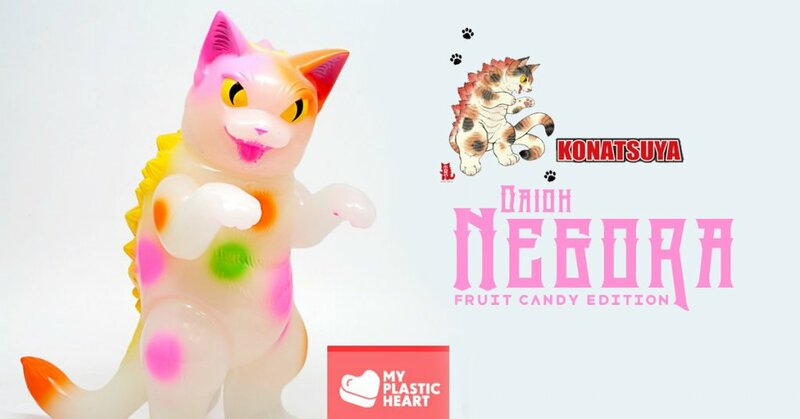 MyPlasticHeart is gearing up Five Points Festival 2018 with Daioh Negora Fruit Candy edition. Daioh Negora invades Five Points Fest this year with a fruity new colourway! “Fruit Candy” Daioh Negora by Konatsu Tunacan features milky white translucent vinyl with pink, green, yellow and orange spray. It’s yummy-licious. Side note although Daioh Negora Fruit Candy may look tasty but we wouldn’t recommend you trying to eat it or lick it, HA. Going to be a ton of news about Five Points over the next few weeks. The best way to get this news is via the TTC Mobile App. You’ll get it first before our social media channels get it. Designer Toy news the EASY way!